The Grove Grill is a family-owned restaurant with a casual neighborhood atmosphere, serving high quality chef-driven dishes at a reasonable price. Dishes feature fresh locally sourced ingredients and scratch made elements, integrated into a large menu selection. We offer private rooms that perfectly suit for a range of events. We can help you host a seamless event. Whether you are in need of a seated dinner with a multiple course meal, or a large space with custom hors d’oeuvre options for a cocktail party, or simply a room for an intimate gathering of friends or business partners, we can provide the experience you are seeking. 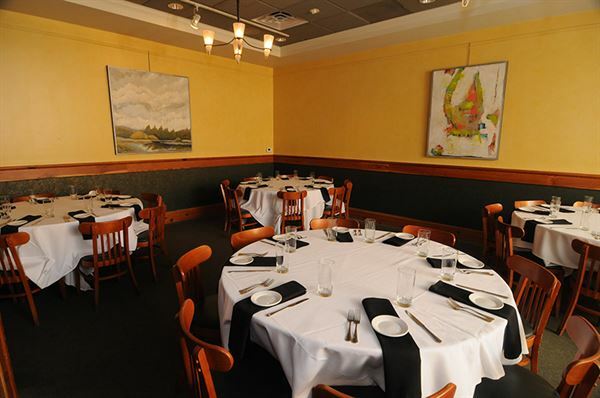 Rehearsal dinners, bridal showers, business luncheons, presentation dinners, private rooms for family gatherings, and entertaining business guests. Our rooms can be arranged and customized to suit your event. We offer a range of different pre-fixed price set menus for large parties, available to adjustments upon feedback. Our chef and team will help your event stand out as polished and seamless, while you sit back and enjoy. This is not to be thought of as a deposit or fee, but a guarantee. The food and beverage minimum is the amount of food and beverage purchases due to meet the room requirements. All food and beverage purchases count towards the minimum. Any amount due unspent will be charged as a Room Charge to meet the minimum. The Food and Beverage Minimum does not include service charges, sales tax, A/V equipment. Large Room | $1,200 Minimum Medium Room | $800 Small Room | $400 Semi Private Room | None Please see attached PDF for additional information. The large private dining room can be set up to suit your needs. Large rounds can be arranged to comfortably view a speaker’s presentation, or seat a large group for a seated dinner. Seats between 20-60. Located within view of the main dining room, the semi-private room offers an exclusive feeling with the charm of the restaurant. Perfect for casual events. Seats up to 20 at separate tables. Perfect for private business meetings and small groups. Up to 15 can be seated at one large table. Seat up to 25 at multiple rounds or 20 at one long table. Crecent style seating optimal for presentations available depending on room availability and party size. Staff, planner, wait staff, and chef were all excellent to work with. The location has wonderful parking and is safe place. The food was great and everyone (69) people enjoyed their meal. Highly recommend!!! !